Scientists from the University of Washington and NASA are experimenting with miniature magnetospheres as an innovative form of space transportation. October 4, 2000 -- "Mom! I'm going shopping on Ganymede today. Can I have the keys to the saucer?" "Yes dear, but be home in time for supper. And I heard there's going to be an awful solar flare today, so be careful! Space-age moms have more to worry about than ever.... But if a group of NASA-funded researchers have their way, parents in the next century can breath a little easier. Every family saucer will come equipped with a fuel-efficient magnetic bubble that speeds its occupants from planet to planet and wards off the very worst solar flares. 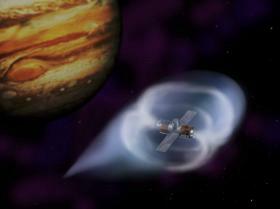 Above: An artist's concept of a space probe riding a solar-wind driven magnetic bubble past Jupiter. Most planets in the solar system already have such bubbles -- they're called magnetospheres. Earth's magnetosphere is an extension into space of the familiar magnetic field that causes compass needles to point North. Our planet sits at the heart of the bubble, which occupies a volume at least 1000 times greater than Earth itself. The magnetosphere protects us from solar wind gusts and from potentially deadly solar flares. Without it, Earth might be as barren as Mars or the Moon, two worlds without magnetospheres. "The magnetosphere not only shields us from solar radiation but it also acts something like a solar sail," says Dennis Gallagher, a space physicist at the Marshall Space Flight Center. "The solar wind pushes on the magnetosphere constantly, but fortunately Earth is just too massive to blow away." What might happen, though, if we created a magnetic bubble around something much smaller than the Earth -- like a spacecraft? Could it ride the solar wind from planet to planet? Gallagher and his colleagues think so. "If we launched a space probe now equipped with such a bubble it would easily overtake Voyager and become the first spacecraft from Earth to cross the boundary into interstellar space." The ingenious notion to use miniature magnetospheres as a form of advanced propulsion was first suggested by Robert Winglee at the University of Washington. The NASA Institute for Advanced Concepts awarded Winglee a Phase I Revolutionary Advanced Concepts grant two years ago followed by a Phase II contract, and already the idea has leapt off the drawing board and into the lab. "We've just finished our first round of tests in a 20 by 30 foot vacuum chamber here at the Marshall Space Flight Center," says Gallagher, the experiment's principal investigator at Marshall. "We're conducting the tests as a cooperative effort between NASA and the University of Washington, with support from the University of Alabama." "The magnetic field for our magnetosphere comes from a 1-ft diameter coil of 16 gauge enameled wire. We run 5 to 30 amp currents through the coil; that creates a 300 gauss field at the mouth of the solenoid" -- about 3 times stronger than a typical refrigerator magnet. The Marshall scientists use a more down-to-Earth plasma source for their M2P2 experiments -- a helicon plasma generator, which ionizes gaseous argon and helium with high-power radio waves. "Helicons are fairly common," noted Gallagher. They are routinely used for fundamental plasma research and to etch commercial semiconductors. "Last week's test was a success. We were able to completely fill the vacuum chamber with a magnetic bubble. The only thing that stopped the expansion was the presence of the chamber walls. 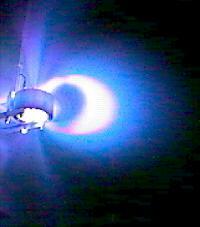 In space this same experiment might create a mini-magnetosphere 15 km across." Maintaining such a bubble in space would require about 1 kW of power and less than 1 kg per day of helium propellant for the plasma source. In return, the bubble would intercept about 600 kW of solar wind power. "One of the advantages of M2P2 is that it requires no new technology," says Gallagher. "The plasma sources and solenoids at the heart of the bubble are off-the-shelf devices." "M2P2 is a 'constant-force' device," he added. "And that's another big advantage. If you sail the spacecraft far from the Sun, you won't lose thrust." Most planets are huge magnets with magnetic fields that extend far into space. The exceptions are Venus, Mars, and probably Pluto (although we have not yet visited Pluto and don't know for sure). When the solar wind runs into a planetary magnetic field, the electrons and ions are deflected around it. The cavity that the planetary magnet carves out is called a magnetosphere. It's shaped something like a comet with a long tail that points away from the Sun. Jupiter's magnetosphere is the biggest thing in the entire solar system. Not only is it large enough to hold all of Jupiter's moons, but the Sun itself could fit inside many times over. If you could see Jupiter's magnetosphere at night, it would appear to be nearly twice as wide as the Full Moon. The force exerted on a magnetic bubble depends on how big it is. Big bubbles intercept more solar wind than little ones do and thus lend greater thrust to the spacecraft inside. Bubbles that travel away from the Sun naturally expand as the solar wind pressure plummets. They grow for the same reason that a child's balloon inflated at sea level will expand in rarefied air at high-altitudes. "The sizes of balloons and of magnetic bubbles are set by the same thing -- a balance of internal and external pressures," says Gallagher. "For M2P2, the internal pressure comes from the plasma and the solenoidal magnetic field. The external pressure is the solar wind." The solar wind's force per unit area decreases as the square of the distance from the Sun. Doubling the distance, for instance, decreases the solar wind pressure by a factor of four. "The solar wind is weaker far from the Sun, but the bubble is bigger, too (precisely because the solar wind pressure is lower)," he continued. "It so happens that the cross section of the bubble increases by the same factor that the solar wind pressure declines. The two effects completely cancel." It seems amazing, but the propulsive thrust of an M2P2-powered craft remains the same whether the spacecraft is near the Sun or in the outer reaches of the solar system. For human travelers the greatest advantage of M2P2 might not be steady acceleration or fuel efficiency, but rather its impressive safety features. Just as the Earth's magnetosphere protects us from solar radiation, an M2P2 bubble could shield spacefarers from cosmic rays and solar flares. "The magnetic shielding idea needs to be investigated more carefully," noted Gallagher, "but it looks promising. By chaining multiple M2P2 units together on the same spacecraft, we should be able to minimize plasma losses and end up with a better cosmic ray shield as a bonus." "I like to think of M2P2 as the first externally-powered fusion engine," he concluded. "The engine is the Sun itself -- M2P2 bubbles just ride along on the exhaust." The next round of M2P2 tests is slated for 2001. Buoyed the success of the ongoing lab experiments (and, of course, by the solar wind) magnetic bubbles could well become the space carriage of choice for the next century. Mini-Magnetosphere Plasma Propulsion studies at the Marshall Space Flight Center are a cooperative effort between NASA and the University of Washington, with support from the University of Alabama. A Look at Jupiter's Magnetosphere -- from "Windows to the Universe"